The lighthouse is a square white tower on the fog signal building. The building is 30 feet high. It replaced the original tower between 1970 and 1973. On the southwest point of White Head Island, Whitehead Harbour, Guysborough County. 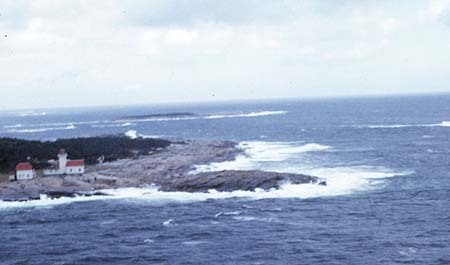 White Head Island, Guysborough County is the closest piece of Nova Scotia to Sable Island, we always said. 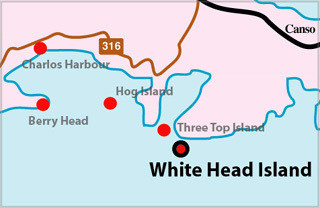 White Head Lighthouse was first established and manned in 1854. The light was closed as a manned lightstation in June, 1988. This I know for sure, because we were the last keepers to leave the light, on one of the saddest days of our lives. There are so many stories one could tell about living at a lighthouse, but the question is where to begin? White Head was a beautiful place to live and raise a child. My husband was losing his job at Mount Saint Bernard College. The college was closing down the boiler plant where he was a stationary engineer. One of the nuns told him they were looking for lightkeepers. Us, lightkeepers! I was terrified of boats and water! Guess who got the job? I cried for days, but I wanted to go. I was just scared to death! Becoming a lightkeeper was an experience of a life time. Being a lightkeeper, you learn to respect the sea. We weren't out there too long when my husband hooked up our old CB radio. We used it to try and find someone to talk to. But no one ever answered and we did not know anyone ashore. One foggy day -- and boy was she foggy, I don't think I ever seen such fog -- we were working around the house and we heard someone trying to get a hold of one of the other fishermen. But no one answered. Then, in desperation they said "Can anyone hear me? I am broke down." John, my husband ran for the radio and called him back . I heard him say ''This is the lightkeeper on Whitehead, can I help you? Sure I will go get you. I am new here, and I don't know the area that well, so I will tell you what I will do, when I get aboard the boat, you keep talking to me, and I will find you that way.'' I said to myself, how is he going to find him? But John just followed the radio signal. He went were it was the strongest and found the fisherman. His transmission had broken down and he was so happy to see someone! My husband towed him ashore. It was our first rescue and it sure made us feel good. After a few months, we adopted our son. We took him to the lighthouse when he was five days old. Bringing up a child on a lighthouse is quite different than on shore. We thought that if we made sure he listened to us and we always told one another the truth and trusted one another we would make things much easier living in isolation. If we ran into trouble, we would have one another to rely on. This proved itself time and time again. When John-Curtis was older he would run down the walk, climb up on a big rock and yell ''Daddy catch me!" Before his father would get there he would jump, trusting his father to be there to catch him. One day the head keeper had to go ashore. There was a storm coming and we had to take the boat up. John-Curtis was just crawling around. It was in the winter, the slipway was icy, and the north wind was blowing right sideways on it. John took the head keeper ashore. I knew he wouldn't be long, so I got the baby dressed, and watched for the boat to come out around Three Top Island. That would give me time to get to the boat house and pull the cable down to hook the boat on. It was about half a mile across the island, so I put my son on the sled, and away we went. I got there just in time. John was sailing around waiting for me. I couldn't leave the baby up there in the boathouse, so I tied him in his sled. I grabbed the cable and went down to wait for the boat to come up the slipway, but I slipped and down I went in between the planks. John had taken the locks off the motors and took a run for the slipway. I thought to myself, if he gives it the gas, he will go right over me, and kill me. I knew he couldn't see me so I started to pray, still trying to get out. In the meantime John had a feeling something was wrong and he let up a bit, something he never did. He couldn't find me but then he saw my head. It wasn't easy getting out, the water was so cold, and I keep losing my footing. I tried to get my foot on something to push myself up and out, but it wasn't working. At last I got hold of a plank. After a few tries, I got back on my feet. I thought to myself, now Gloria, stay on your feet, at least until you get that boat hooked on. John had taken the boat for another turn around, and tried again. This time the boat came up far enough for me to hook her on. I got to the side of the slip, where we had a walkway, and I ran for the boathouse. John was not far behind. Just as we reached the top, we were met by our son, crawling toward the door. He had a big smile on his face, as much as to say "Me coming mommy!" We went back to the lighthouse, thanking the Lord for yet another miracle. Like life anywhere, you have your good and bad days. I remember once we had to go ashore to get supplies. It was April, the best time of the year because the fishermen were back fishing. We caught a ride in shore with one of them. We then went to Canso, got our supplies and headed back for Whitehead. John never liked to be off the island long. When we got there, it started to rain. Boy did it rain! John called the island on the CB radio, but the head keeper said he wasn't coming ashore in this weather. We decided to go out in the morning with one of our friends, Howie. He woke us up in time to go out with him, but he said "You should wait till Morlie goes out, it might be better." Five o'clock came and we were ready to go. We had double-bagged all our groceries. The rain never let up, and we wanted to get back to the light. A northeast wind started to blow and the tide was low. The closer we got to the island, the harder it rained. It was like hail and danced off the water. Morlie said he never seen such weather in years. I was the worse luck he had ever seen. He was always teasing me that I was a real Jonas. All this for a few groceries? Getting groceries is quite an ordeal when you are an island lightkeeper. You go to the store, put them in a cart, put them on the checkout, put them in your cart, then in your car. Then you put them on the wharf, then in the boat, go to the island, put them on the dock, then you put them on the tractor and trailer, or in the wheelbarrow, then go to the house, carry them up to the house, and finally put them away. We ate a lot of scrambled eggs. The first time we got groceries, we put them in the boat, went up to the road to talk to someone, and the seagulls got in them. Thank goodness we were close because in a few minutes they made an awful mess. Now back to my story. Morlie took the boat to the dock and John got out. He couldn't stay at the dock though as it was to rough. John tried to get the water out of the little boat to come out for us. As fast as he poured the water out of her it would fill up. He had to turn the boat up side down. Finally he got the boat in the water and came for me and the groceries. When we got back to the dock, it was really rough. John had a great time trying to pass me the bags and keep the boat from turning upside down. The bags were sitting in 3 or 4 inches of water. When we finished, John went out for the baby. When he came back in, I couldn't reach John-Curtis, so I had to climb down the dock and climb up with him in my arms. If you could see how small I am, you would wonder how I ever carried him around. Then we had to get the boat up, but because it was so full of water and it was so heavy it was no easy task. Morlie was watching all this, laughing and blaming me for all the terrible weather. "We were not supposed to get this type of weather," were my famous last words. It lasted for three days. When we got to the house, thanking the good Lord, we poured the water out of our boots and took our oil clothes off. We were soaked to the hide, but a little water never killed anyone. My poor groceries, I poured them out on the floor, the water went right through all the plastic bags. Oh well, we saved most of them. Then, we sat down and had a good laugh. It was just another day on a lighthouse. People wouldn't believe the things you get yourself into while being a lightkeeper. You'd be surprised what people think about lighthouse life. The head keeper used to tell everyone ashore "You know the shows you watch on TV? They last 1 hour. Well, we watch them in forty five minutes, because we have diesel power and it runs a little faster than Nova Scotia Power does." My cousin thought we had to go to bed at dark because we didn't have any lights. My husband just said to him, "What do we live on a lighthouse for but to run the light?!". Tower Height: 035ft feet high.